I knew I must have missed a day of watering when I stepped outside to see all of my red turnips wilted and dead. I don’t even want to figure out how much money I lost. But I just liked having a little red turnip farm, to be honest. A lot of flowers from my island were gone, but you can’t see all of the loss in this picture. I’m sure some were hybrids. And the one time I forgot to check my neighbors, Baabara snuck out on me. She came from Kammile’s town and we were going to try and move her back there, I’m so sorry! 😥 There were so many neighbors in my ninth slot at the time because I didn’t know she was going to move and didn’t clear my slots beforehand. Because of that, it wasn’t even really worth trying to do the trade… 😦 She’s the first neighbor to move out who I was trying to keep (I’m usually pretty good about checking neighbors); I guess it was bound to happen eventually. On the final day of the Acorn Festival I received the final piece of the Mush series from Cornimer. 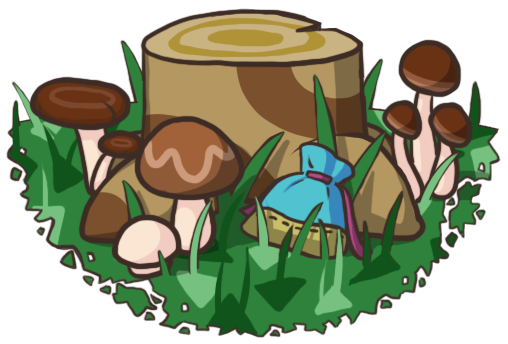 I also participated in my dad’s town and once before in a previous town, so I have three sets of the Mush series now. 😛 Let me know if you’re missing some pieces, I’d be happy to help out. A new house! It’s the same as Curt’s. 😛 I wish the neighbors with this house shape would choose the pink house style so I could have double fans. Sally’s my replacement for Baabara. I like her catchprase, nutmeg. 🙂 I’ve never had her before, so I’ll try to get her picture before she moves (and Tipper’s!). My first step into Rosewood. 😀 Nice outfit, I like it! These breeding spots look improved to me, good luck with growing hybrids! 😀 I also planted a few next to Ables’. I displayed vertical and horizontal bricks-on-dirt patterns and two patterns of my gold cobblestone path (so that the leaves don’t look too repetitive). It’s a great map: I love the river, bridge placements, and positions of the major buildings! Isn’t it cool how all of the major buildings are on one side of the river and most of the villagers’ houses are on the other side? I think this is how I would lay patterns if it were my town, but everyone has different ways of planning paths (and many have great all-natural towns with no patterns! ), so feel free to do your own thing. 🙂 The orange squares are for the main road and the yellow squares are for side paths. I think I’ll give them to my character Amy in Red Bank since Twisk is reasonably close to earning them herself (9 more fish, 3 more bugs :D). I felt bad about Baabara sneaking out when I had told Kammile that I would try my best in moving her back to StarCity, so I offered to give her a Baabara from an extra gamecard. When she let me know that Bud moved out on Friday, I started resetting over and over, hoping to find a town with Baabara, but she refused to appear. >_< Fortunately Kammile told me that she would also be happy with Gabi, who'd just snuck out of her town, or Peanut, one of her favorites from her original town, Sidney. It was Peanut who appeared first, so I completed Nook’s chores in that town and time-travelled day by day until she moved out — all the way into December! While resetting for Baabara (or Gabi or Peanut), I named all the towns Nimrodel in case I found my second dream town, which is the name I’m leaning towards now instead of Trildale. To complete the trade, Kammile and Violet swapped friend codes and she came over to Nimrodel. There wasn’t much to do, but it was cool being in a temporary town because we could run around all we wanted (we chased each other at one point :P), take flowers, chop down trees, drop stuff on the ground, and look for dandelions and four leaf clovers (didn’t find any of the latter :(). What a cute Pelly dress! We visit Peanut’s vacant spot, she must’ve had a gardening hobby at one point. 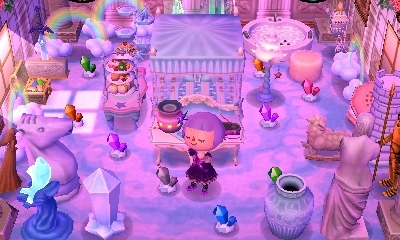 It didn’t look under construction to me; in fact, these are my favorite decorations I’ve seen in her town! We went straight to her house and spent most of our time there because she’s keeping her Halloween party decorations under wraps. Aww, two of her favorite neighbors’ pictures on the living room table. 🙂 Hopefully both will move back! She had to change a few things in the back room, so I waited outside by doing backflips on her bench and checking out her lovely back garden. This is her back room after the changes: a café! It has such a great atmosphere. 🙂 I think adding a checkout counter and vines to the brick wall would be nice. since she was the whole purpose of these WiFi sessions. 😛 And she remembered me! 🙂 I’m glad the trade worked, hopefully we can do it again with Baabara or Gabi and it won’t be as difficult to find them. xP Thanks for letting me see your town even though it’s under construction, Kammile! It looks amazing so far! Her room might could use some tweaking later on as new ideas come to me, but I like it so far. There’s no music in this room, just the sounds of birds and trickling water. 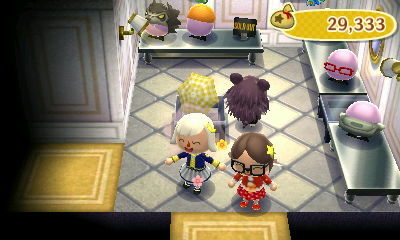 Posted on October 16, 2011 by Amy •	This entry was posted in AC:WW, AC:WW WiFi, Dafdilly and tagged Animal Crossing. Bookmark the permalink. Instead o putting it randomly..
We got the same problem?! Flower loss?! Dead Turnips?! Oh and what happened to your pics? Sometimes wavy or just blurry, Is it because your hands are shaky? You should take multiple pics and pick the best one. I understand, I also do that sometimes, I mean your hand gets shaky because you don’t have any support when taking pics! Don’t be sorry, I hadn’t set off a party popper in ages so it was awesome! 😀 And you’re probably saving some for your Halloween party, right? I also think sparklers and roman candles would be particularly fitting for a Halloween party because they’ll look like wands (for those who dress up as witches) and glow extra brightly in the dark. First, I think your pattern template rocks. I think it rocks so much, that I’m going to ask your permission to steal your blank template when it is finished. Ah, really? 😆 That’s crossed my mind too, but overall I think it’s really beautiful. It comes from the name of a river in The Lord of the Rings, and I think J.R.R. Tolkien comes up with such great names for his universe. But if that’s a common thought when people hear Nimrodel… I’m definitely going to think about it some more. 😛 Thank you so much for being honest about that! Ahhhh!!! Pattern page? OMG! Yay! I’m sure you’re great designing patterns! Sounds like you had great fun with Kammile! 😀 And another gridded map! I got Baabara, and can wifi with Kammile if she wants her back? Also, got an orange rose the day after our wifi, and it’s my first self-grown hybrid! Awesome, congratulations on your first hybrid!! 😀 I hope there will be more to come! Sadly I don't even remember my first hybrid, but in this town it was a black tulip. Yikes! I’m trying to make a blogspot AC blog, but am having a hard time with blogspot crashing.Oh well, I’ll do it tomorrow. Wow, really? That’s great, I can’t wait to see it and good luck with it! Actually, I just decided it will be wordpress! I love it! what is your theme? My theme is called Pool, but you can browse more here. Yes…one day xD And thanks! I don’t think you see many small, one-person run Harry Potter news blogs because it’s hard to compete with fansites like Mugglenet and The Leaky Cauldron, which have whole teams working for them and connections with Warner Bros. I found this list of Harry Potter blogs just now through google, but I recognize a lot of the names on that list, so they don’t seem like small blogs… I’ve always liked the LJ community HP Common Room because it’s discussion based. palettes! You can easily make a Fountain at Palette 13! shirt and everything from your clothes! The pro designs do sound awesome; I’d probably never wear regular clothes in AC:CF since you can customize what you wear so much more with a pro pattern! I’ve seen people add angel wings to the back of clothes, which is a really cool idea to take advantage of the new feature. Man, I can’t wait for AC:CF! I can not have a blog to AC: WW I guess because my parents would not let me because it would say that is too much, since I have to study! PS: Just one question, your blog is down? Because the mine if …. much! Sorry, I don’t know what you mean with the PS.